Court Street, behind Buffalo City Hall, was one of the richly complex streets of the Lower West Side. This photograph, taken by Wilbur H. Porterfield in 1932, captures Court Street looking west from City Hall toward the Erie Canal. In the background, west of the canal, the Georgia Street bridge connects downtown to the lakefront, coal trestles and pockets dominate Erie Basin, and Centennial Park (LaSalle Park) is in the early stages of development. East of the canal, on the south side of Court Street, the Montgomery Door & Box Co. occupies a four-story lumber mill that was Buffalo’s largest and oldest, with origins dating to 1840. On either side of Court Street, two-to-four-story buildings house ground-floor bakeries, coffee roasteries, and the like. At one tenement building, on the corner of Court Place, two clotheslines are visible. On the lower left, Court Street intersects with the Terrace, one of surveyor Joseph Ellicott’s original parks dating to 1804. A six-story tower, used for training firefighters, stands in the Terrace. On the right, north of Court Street, is the Italian Colony, one of Buffalo’s most densely populated neighborhoods. 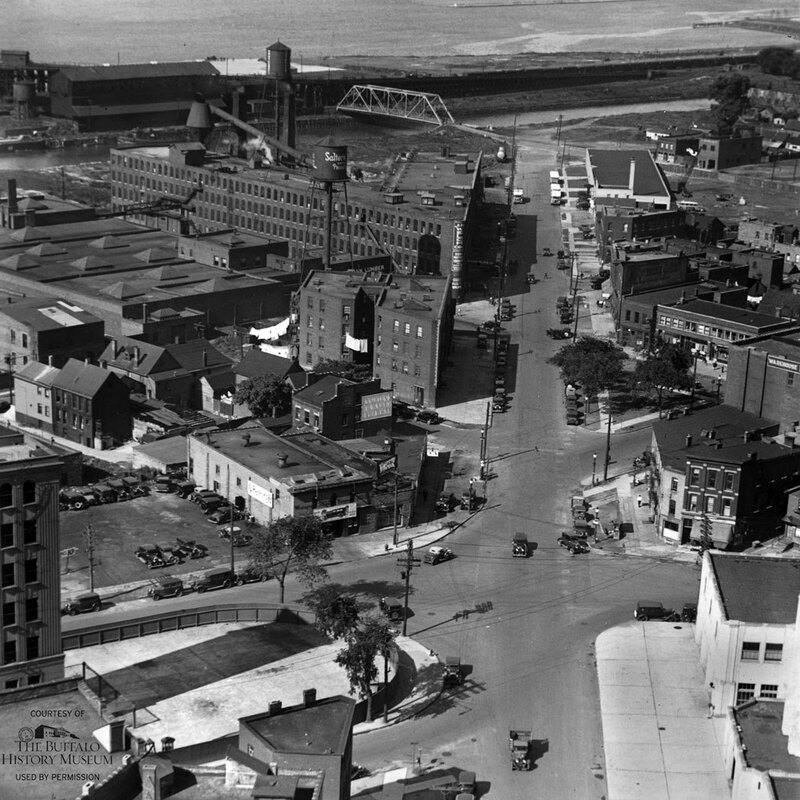 Everything in this scene, with the exception of LaSalle Park, part of Court Street, and the fire department headquarters, has been erased. The canal was filled in starting in the mid-1930s and was eventually replaced by the I-190. The Terrace was largely eliminated, starting with the construction of the Skyway. The Waterfront Urban Renewal Project, starting in 1963, did the rest.